We got so much pretty fluffy snow on Friday night! Just look at the big grin on the Dogasaurus' face. He ♥'s snow so much. Friday after work I ran home to give Rex dinner and take him out. He was so disappointed that we only went to the end of the block and back that I promised to give him a nice long walk when I got back home later. Then I hopped back on the crappy roads to head out to the Theater Garage to see Joking Envelope's production of Super-Powered Revenge Christmas #1. It was really awesome & entertaining. If you have a chance you should go check it out. It's going to be running through Dec. 18th, and you can get $5 off tickets with a 2010 CONvergence badge or by wearing any CONvergence merchandise to the show. Bill Corbett (MST3K) wrote the play, so you know it'll be funny! After the play I chatted with Bill & some of the CVG folks before heading back out into the blizzard. There had to have been at least a good 8" or so of snow on the ground when I got home. I bundled on up, grabbed my camera, and headed to the park with Rex. Unfortunately since it's winter now the hockey rink in the park is filled with ice, and the doors at the end were propped open so I couldn't just let Rex off leash to run & run & run. 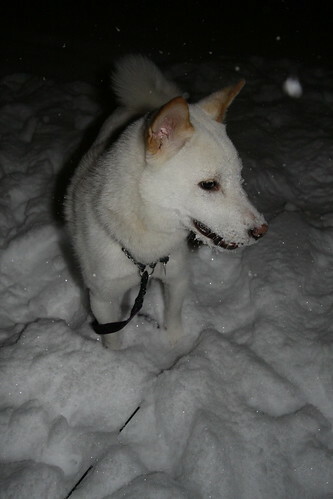 He still managed to have fun bouncing around in the snow while on the leash though. I'm sure all that time outside didn't help my cold much though. :( It's so not fair having a cold right when there's so much awesome snow for Rex. On Saturday I was supposed to take technomonkey_m to his soccer practice, but genevra's plans were cancelled so she could do it. M still wanted me to go though so I went over and we all went. I'd been considering bring Rex to play w/the kids after, but after Friday's walk I knew my cold couldn't take me playing outside too much. When I came in the door at genevra's the monkeys came running up to hug me & were all excitedly asking me "Is Rick here too?" I explained that no, Rick was off playing video games with their dad & they said "No, we didn't say Rick, we said Rex." LOL Poor Uncle Rick, traded in for a dog. It would have been fun to go sledding with genevra, Monica & the Monkeys, but it would have been really bad for my cold. *sigh* Stoopid snot monsters. omg, powder snow. I want to play in it too! Rex! What a handsome chap! For the record, I love puppy pics. PUPPY!!!! Of course the monkeys want to play with the puppy!